Baseball or softball batting cages are great addition to any backyard. We feature portable (no digging or cementing) batting cages as well as practice screens that are built to last. 1. Batting cages allow baseball and softball teams to maximize practice time and practice space. Conducting batting practice within a practice cage gives players a maximum number of swings without keeping track of where the balls go. Batting cages can be setup in compact areas, or even indoors, to help keep your team hitting whenever inclement weather persist outdoors. 2. Don't let lack of room prevent you from enjoying the benefits of a batting cage. You need to understand the space you have available for a batting cage, and practical to know that a hitting net and batting cage may be constructed with a length as short as 35 feet. Hunt out your potential areas and find the best batting cage to suit your needs. 3. 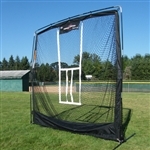 Batting cage nets are important for keeping balls near by, and for guaranteeing the safety of others playing and practicing nearby. Nylon netting is a strong option, sure to keep balls from escaping, but tend to become weathered with continual exposure to the outside weather. Polyethylene nets can withstand outdoor weather and are lightweight, which means you won't need as heavy of a batting cage frame. 4. When shopping for hitting nets, the standard twine sizes are No 42, #36, and # 21; the larger numbers will be the heaviest. Heavier nets are more effective at enduring daily use, and keeping baseballs and softballs nearby. 5. One of the best points about batting cages is that you are able to fit one almost anyplace. Bigger batting cages are usually safer for the batting-practice pitcher or ball feeder, who should always work with a pitching screen, regardless of the cage size. An increased net area in width and height also enables players see where their swings take the ball, making batting practice a more efficient learning tool. 6. Common recommendations with regard to building a batting cage suggest using cage frame supports for every 20 feet of net and also on each end. The goal is to suspend the net so it absorbs hit or pitched balls safely and doesn't droop. The larger the batting cage, the more frame sections you'll need. 7. With no batting cage, batting practice would consist of shagging balls, chasing after fouls and pop ups, and worrying concerning the safety of other players in the vicinity. Hitting nets allow you and your players to concentrate solely on your swing action. Baseballs can be gathered safely and easily, and the remainder of the team can focus on their drills, knowing the hitting net will halt every ball. 8. With hitting nets, you can perform a multitude of individualized and specific practice drills. Players and coaches can incorporate hitting nets into soft toss or hand toss drills, as well as work on swing techniques while using a batting tee. 9. Sometimes hitting off a tee is simply what it takes for the player to get back his or her groove, and a batting cage is a perfect location for it. 10. Portable pitching screens provide a perfect solution to spend extra time with the family in your yard, or can function as pre-game warm-up aid for travelling teams. Lots of pitching screens provide a pitcher an easily identifiable target and also help contain the ball too. Several companies make great batting practice backstops if a batting cage is not available. 11. 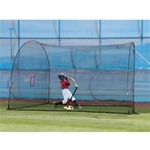 L-screens or other shielding screens are a must for batting practice pitchers and the ones who feed pitching machines. These types of safety products usually flip to adapt to right- or left-handed pitchers and are easily portable. 12. Transportable backstops may be helpful for teams that travel frequently or utilize numerous practice sites. These types of backstops can assist with a wide array of warm-up drills, and are simple to knock down, carry, and setup again.